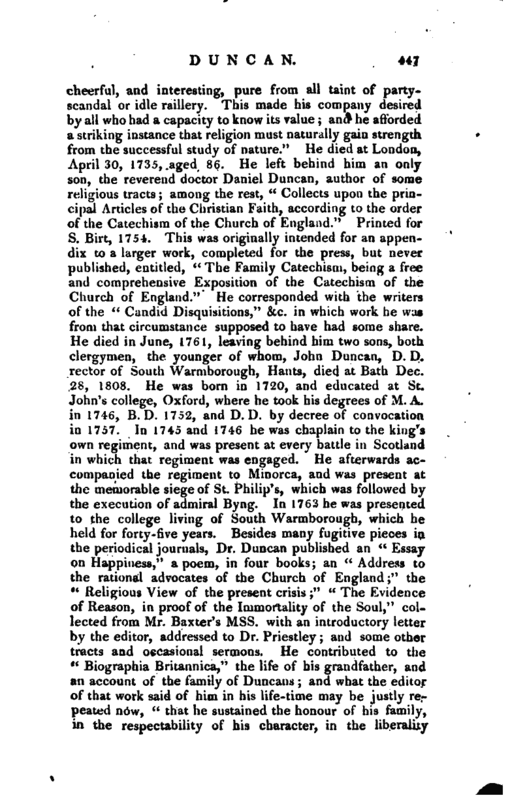 A long account of this family is given in a note on Mr. Duncan’s article in the Biographia Britannica. 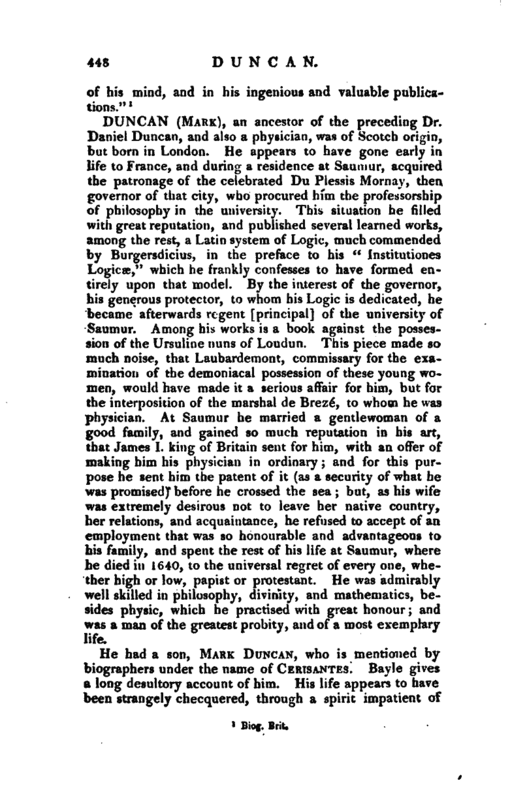 His ingenuity and application recommended him to the esteem and friendship of his principal instructor there, the celebrated Dr. Charles Barbeyrac (uncle to John Barbeyrac the famous civilian), whose medical lectures and practice were in high reputation. 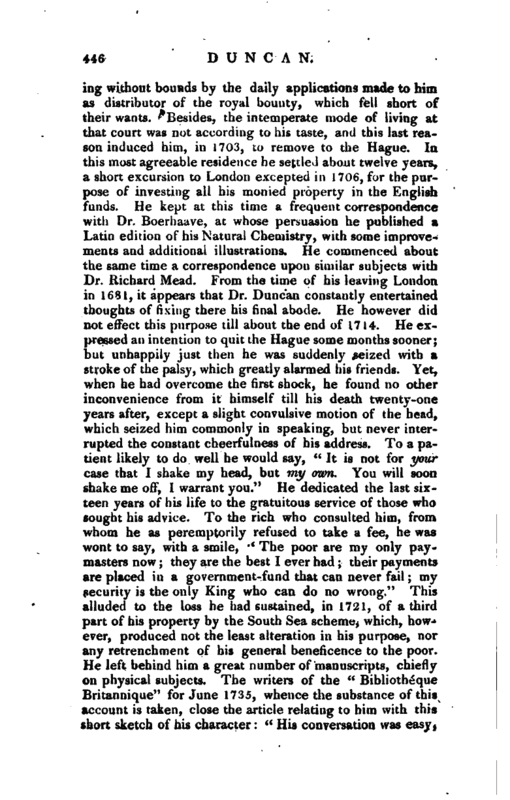 Having taken his favourite pupil into his own house, the professor impressed and turned to use his public and private instruction by an efficacious method, admitting him, at every visit he paid to his patients, to consult and reason with him, upon ocular inspection, concerning the effect of his prescriptions. When he had studied eight years under the friendly care of so excellent a master, and had just attained the age of twenty-four, he was admitted to the degree of M. D. in that university. From Montpellier he went to Paris, where he resided nearly seven years. Here he published his first work, upon the principle of motion in the constituent parts of animal bodies, entitled: “Explication nouvelle & mechanique des actions an i males, Paris, 1678.” It was in the year following that he went for the first time to London, to dispose of some houses there, which had descended to him from his ancestors. He had, besides, some other motives to the journey; and among the rest, to get information relative to the effects of the plague in London in 1665. Having dispatched his other business, he printed in London a Latin edition of his “Theory of the principle of motion in animal bodies.” His stay in London, at this time, was little more than two years; and he was much disposed to settle there entirely. But in 1681 he was recalled to Paris to attend a consultation on the health of his patron Colbert, which was then beginning to decline. 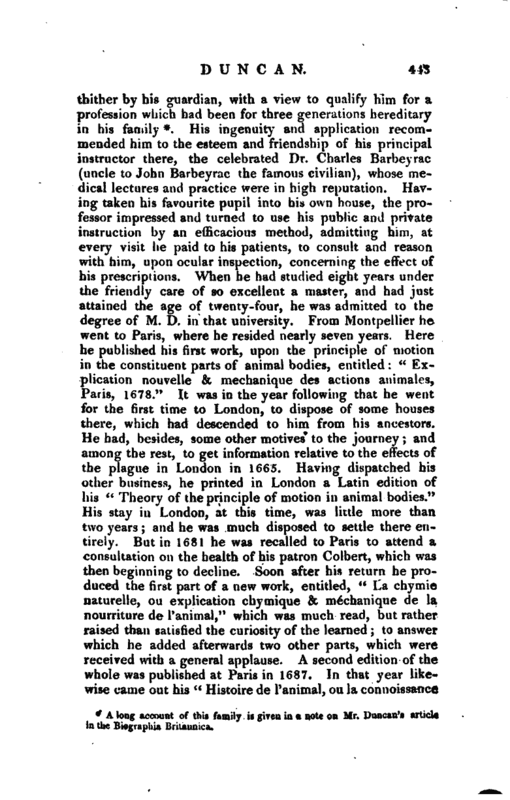 Soon after his return he produced the first part of a new work, entitled, “La chymie naturelle, ou explication chymique & mechanique de la Tiourriture de Tanimal,” which was much read, but rather raised than satisfied the curiosity of the learned; to answer which he added afterwards two other parts, which were received with a general applause. A second edition of the whole was published at Paris in 1687. In that year likewise came out his “Histoire de l’animal, ou la connoissance | du corps animé par la méchanique & par la chymie.” He left Paris in 1683, upon the much-lamented death of Colbert, the kind effect of whose esteem he gratefully acknowledged, though in a much smaller degree than he might have enjoyed, if he had been less bold in avowing his zeal for protestantism, and his abhorrence of popery. He had some property in land adjoining to the city of Montauban, with a handsome house upon it, pleasantly situated near the skirts of the town. It was with the purpose of selling these, and settling finally in England, that he went thither from Paris. But the honourable and friendly reception he met with there determined his stay some years in his native city. In 1690, the persecution which began to rage with great fury against protestants made him suddenly relinquish all thoughts of a longer abode in France. 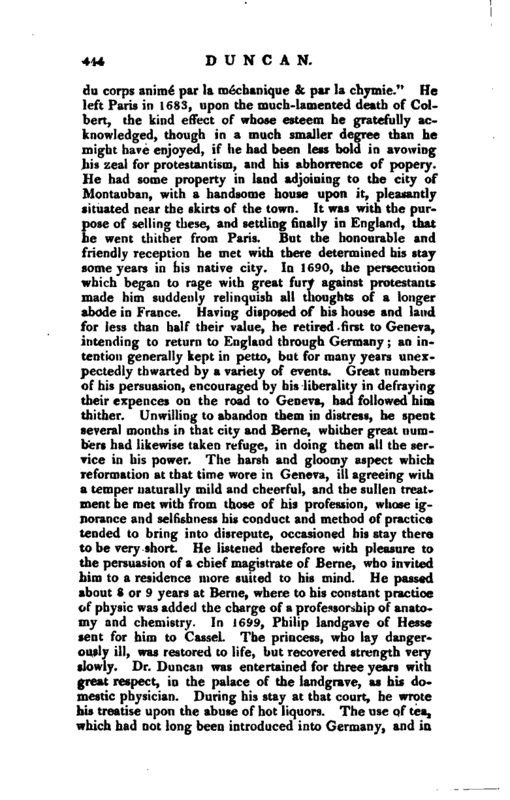 Having disposed of his house and land for less than half their value, he retired first to Geneva, intending to return to England through Germany; an intention generally kept in petto, but for many years unexpectedly thwarted by a variety of events. Great numbers of his persuasion, encouraged by his liberality in defraying their expences on the road to Geneva, had followed him thither. Unwilling to abandon them in distress, he spent several months in that city and Berne, whither great numbers had likewise taken refuge, in doing them all the service in his power. The harsh and gloomy aspect which reformation at that time wore in Geneva, ill agreeing with a temper naturally mild and cheerful, and the sullen treatment he met with from those of his profession, whose ignorance and selfishness his conduct and method of practice tended to bring into disrepute, occasioned his stay there to be very short. He listened therefore with pleasure to the persuasion of a chief magistrate of Berne, who invited him to a residence more suited to his mind. He passed about 8 or 9 years at Berne, where to his constant practice of physic was added the charge of a professorship of anatomy and chemistry. In 1699, Philip landgave of Hesse sent for him to Cassel. The princess, who lay dangerously ill, was restored to life, but recovered strength very slowly. 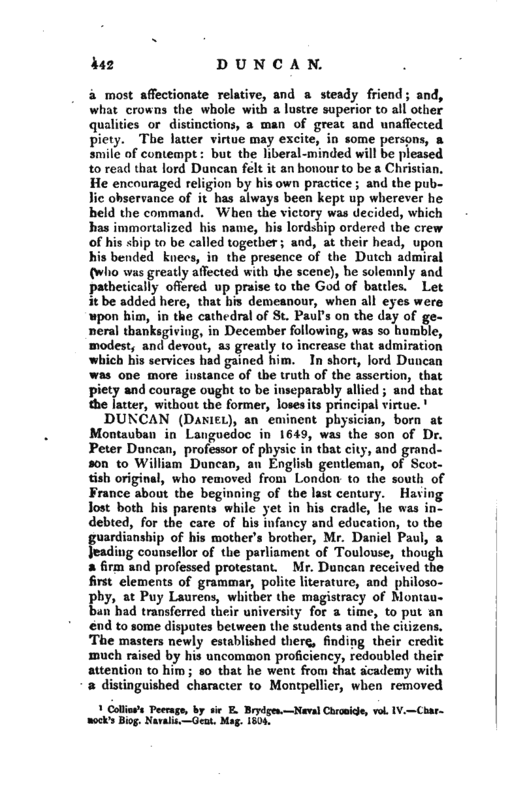 Dr. Duncan was entertained for three years with great respect, in the palace of the landgrave, as his domestic physician. 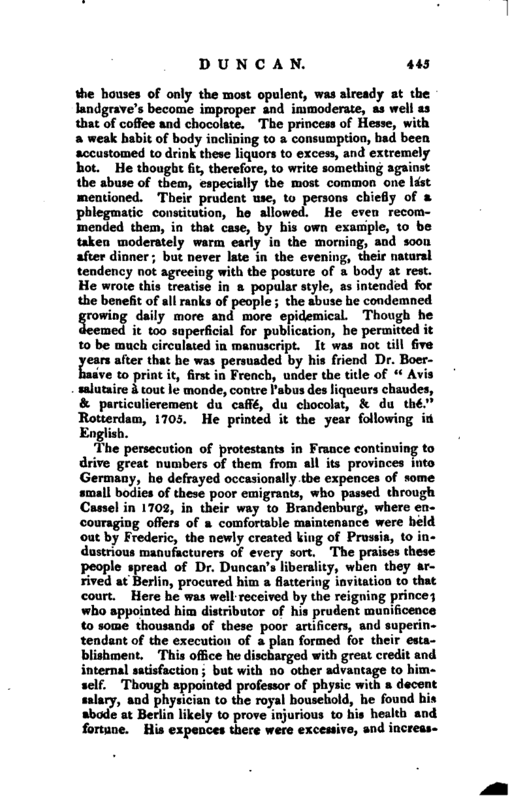 During his stay at that court, he wrote his treatise upon the abuse of hot liquors. The use of tea, which had not long been introduced into Germany, and in | the houses of only the most opulent, was already at the landgrave’s become improper and immoderate, as well as that of coffee and chocolate. The princess of Hesse, with a weak habit of body inclining to a consumption, had been accustomed to drink these liquors to excess, and extremely hot. He thought fit, therefore, to write something against the abuse of them, especially the most common one last mentioned. Their prudent use, to persons chiefly of a phlegmatic constitution, he allowed. He even recommended them, in that case, by his own example, to be taken moderately warm early in the morning, and soon after dinner; but never late in the evening, their natural tendency not agreeing with the posture of a body at rest. He wrote this treatise in a popular style, as intended for the benefit of all ranks of people; the abuse he condemned growing daily more and more epidemical. Though he deemed it too superficial for publication, he permitted it to be much circulated in manuscript. It was not till five years after that he was persuaded by his friend Dr. Boerhaave to print it, first in French, under the title of “Avis salutaire a tout le monde, contre Tabus cles liqueurs chaudes, & particulierement du caffe, du chocolat, & du the.” Rotterdam, J 705. He printed it the year following in English.